MSI's RTX 2060 Ready to take you to the next levelThe much anticipated return of MSI’s iconic dual fan GAMING series. Combining a mix of black and gunmetal grey with a classy brushed metal back plate, this combination of power and aesthetics provides you with premium design and magnificent smooth RGB light effects on the outside. Compatible with Mystic Light Software synchronize and display your personality on your whole system. Enjoy the future of gaming with NVIDIA G-SYNC and see the difference in frame rate speed and smoothness. Control to Showcase your style To experience and enjoy the impressive world of Virtual Reality, high-performance hardware is required. MSI, world leading brand in high-end gaming and eSports, provides the right advice to make sure your system is VR Ready. Integrating the very best of cutting edge technologies in recommended MSI VR gaming hardware for smooth performance. Together with our VR partners, MSI brings gamers an extremely realistic VR experience where games come alive. Control to Showcase your style MSI Afterburner is the world's most recognized and widely used graphics card Overclocking software. It gives you full control of your graphics card and enables you to monitor your system’s key metrics in real-time. The latest version of MSI Afterburner features OC Scanner for RTX 20 series graphics cards. OC Scanner is an automated function that will find the highest stable overclock settings for your card. Giving you a free performance boost for a smooth in-game experience thanks to higher FPS. Control to Showcase your style Developed under an exclusive partnership with BlueStacks, the MSI APP Player brings seamless gaming experience between mobile games and PC platform, and leverages customized features as specific keyboard lighting and better graphics with multi-task works. MSI GeForce RTX 2060 VENTUS OC 6GB GDDR6 Ray-Tracing Graphics Card, 1920 Core, 1365MHz GPU, 1710MHz Boost is rated 4.8 out of 5 by 4. Rated 5 out of 5 by Chen from Good GPU with a slightly higher price. This GPU works well with the simulation I am running. The prices is attractive compared with other brands. 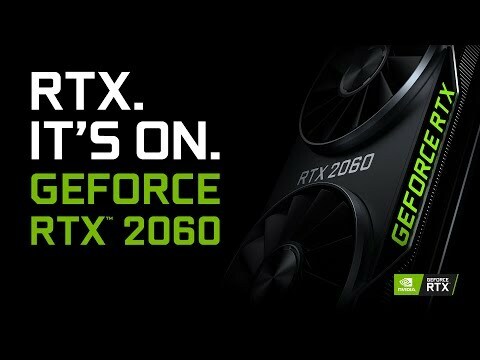 However, it could be cheaper since this is just an entry-level card for the RTX series. Rated 5 out of 5 by Alexmet234 from Very good, future proof and super fast, boosts to 2010mhz out of box Very well designed, performs epceptionally well in Battlefield five around 60-70 fps with ray tracing on and 144-55 with it off. Spot on! Rated 5 out of 5 by GarryCraddok from Bench like an OC 1080 Lucky enough to get one of these on launch day @ 330 sterling. Thanks Scan. I think there may have been some confusion on the pricing and this may have been listed at the XC price? Anyway very pleased as this card totally outperforms its 1060 predecessor by a mile. This is the overclocked edition and as a result the core cannot really be bumped much at all (RTX cards don't seem to like going over 2000hz.) however the new GDDR6 memory overclocks like crazy its early days but I appear stable at +950hz! Using Superposition Benchmark this card gives me a score of 4830 @1080p Ex. This ranks it up with the top 5 1080 scores. Given the price comparison between this and the 1080 make the wise choice and future-proof with the 2060. No RGB which may be a problem for some.